Are you a restaurant owner thinking of ways to serve more customers and increase your sales? If yes, know that you are not the only one. Countless other entrepreneurs have the same dilemma. But in order to differentiate yourself from them, you need to take action now. One way to do that is by revamping your current menu offerings and creating a separate takeaway menu template. 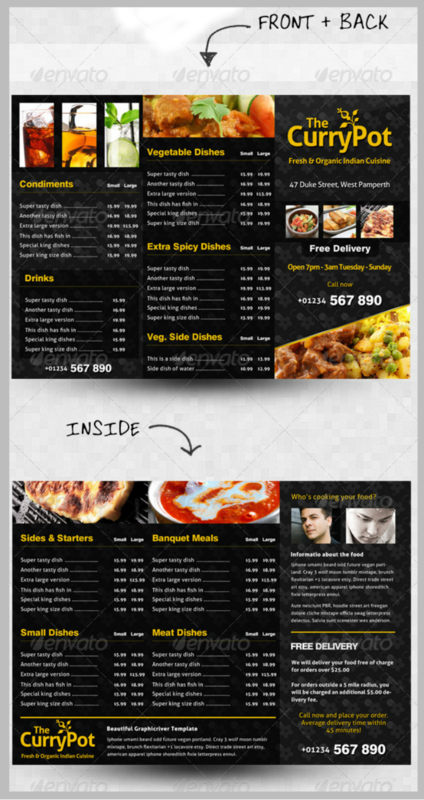 There are 15 different examples of takeaway menu templates included in this article. They are here to help inspire you in creating your own menu card designs without overwhelming you with all the necessary behind-the-scenes work. And to help convince you why you should create a takeaway menu for your restaurant, we have compiled a list of practical reasons. Read on. 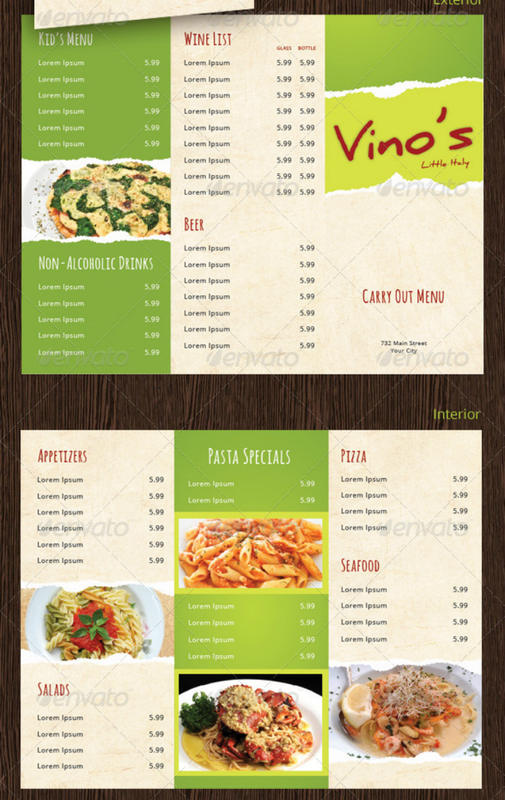 When choosing a takeaway menu card design, the first thing that you should consider is the menu’s layout. A good menu card design is one that follows a bold yet uncluttered layout template. 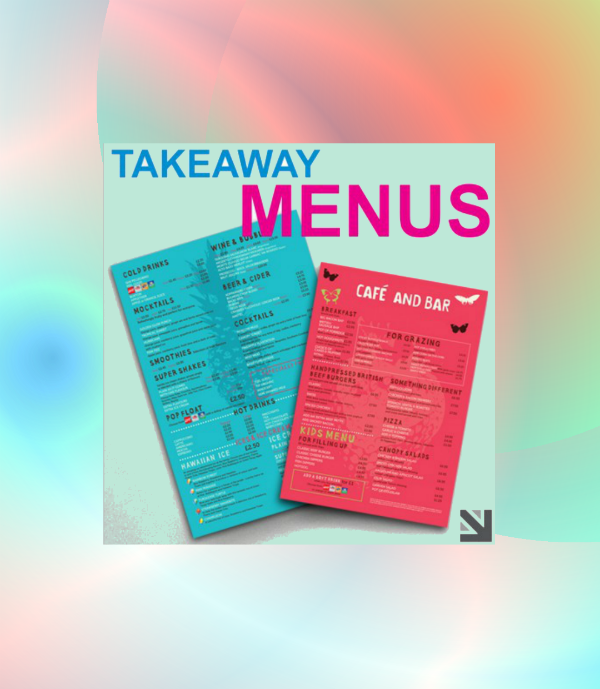 An example is the Cafe and Bar Takeaway Menu Design template embedded above. This menu template allows you to change the font styles, add company logos, and incorporate other design elements that will help match the menu card design to your restaurant’s brand image. 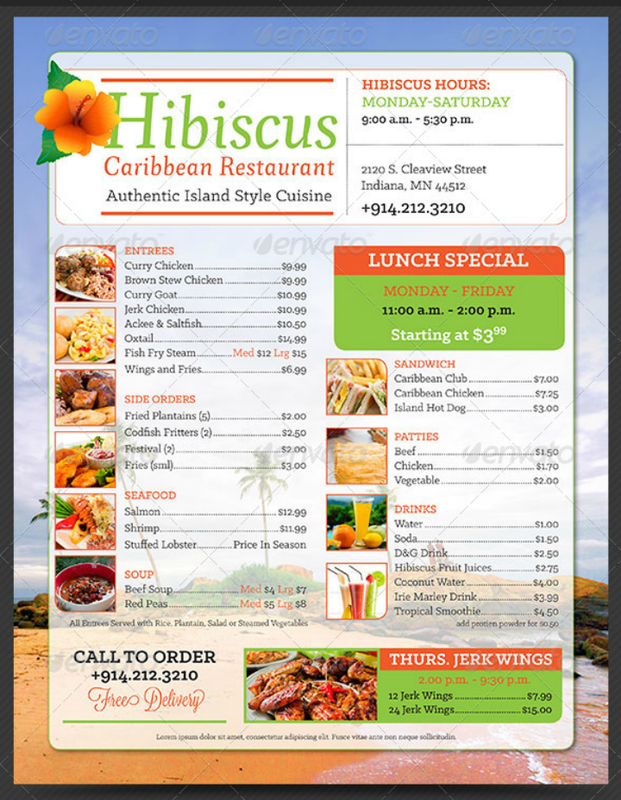 Choose this Caribbean Restaurant Takeout Menu template if you want sparse food images on your menu design. With this kind of menu design, you need to choose the best food photos that represent the main dishes that your restaurant serves. Despite the few images, full attention is given to the menu list and food prices. This menu template is also a good example of how company branding and contact information should be prominently displayed in any menu card design. The most common type of dining establishment that offers takeaway food service is a fast food chain restaurant. 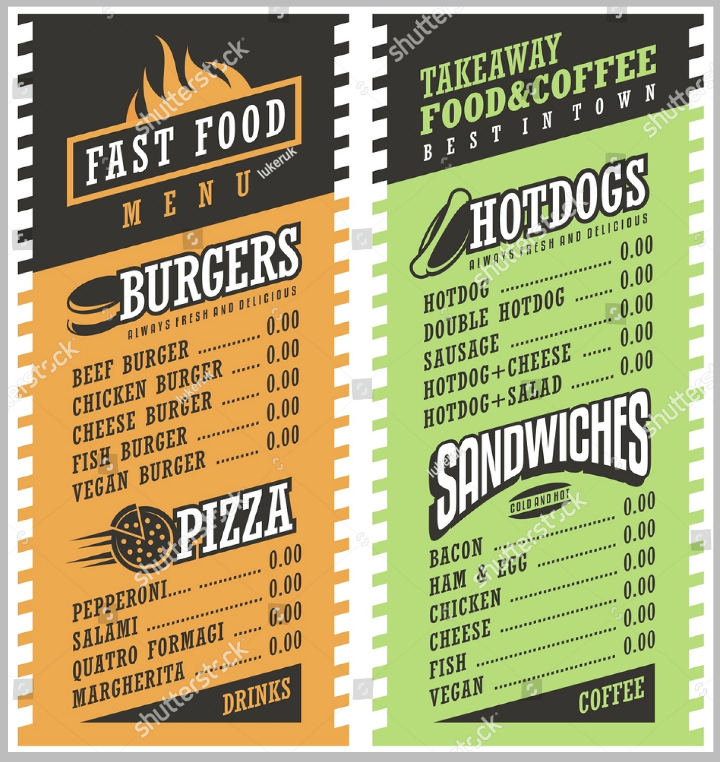 So if you are running a fast food restaurant (even if it does not belong to a franchise chain), you may use the Chalkboard Fast Food Takeaway Menu Design template that is pictured above. This template allows customers to see what they are paying for in its chalkboard design illustrations. The Chicken Shop Takeaway Menu Design shown above is an example of a foldable menu card design. This kind of menu card design may suit those dining establishments that want a comprehensive menu list template. By using bi-fold or tri-fold menu cards, you will have more space to write the meal descriptions and include corresponding images for each meal type. 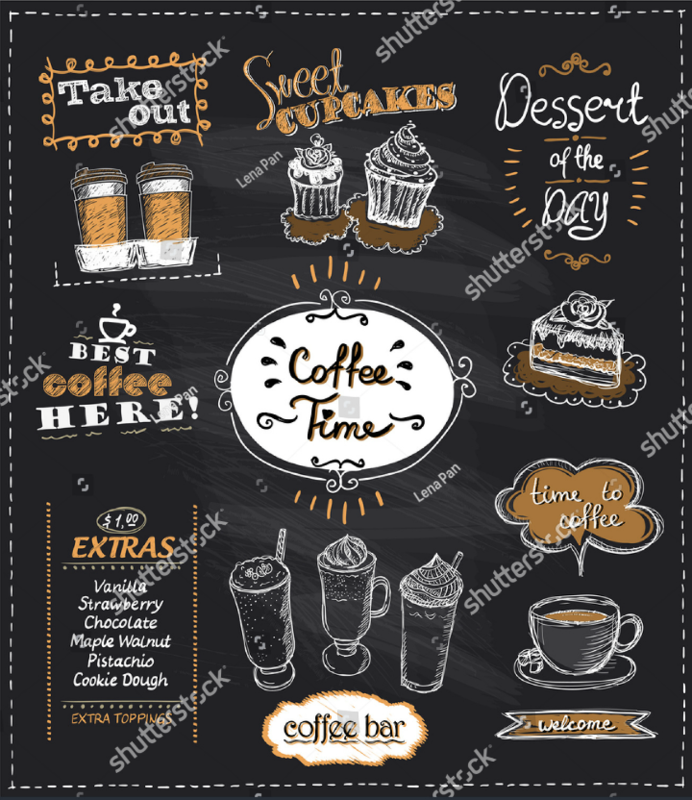 The Coffee Chalkboard Takeaway Menu Design template is best used for cafes, bakeries, and local bistros that offer coffee and pastries. As with any chalkboard menu designs, they are best printed on black card stock or as overhead or banner menus inside a restaurant. To recreate this menu design without using a template, you may commission a chalk artist to draw and write these menu options on a chalkboard. You may then nail the board at the back of the restaurant counter for all customers to see when they go inside the restaurant. Or you may print the menu design on a smaller board and use this as a standee placed outside your dining establishment. 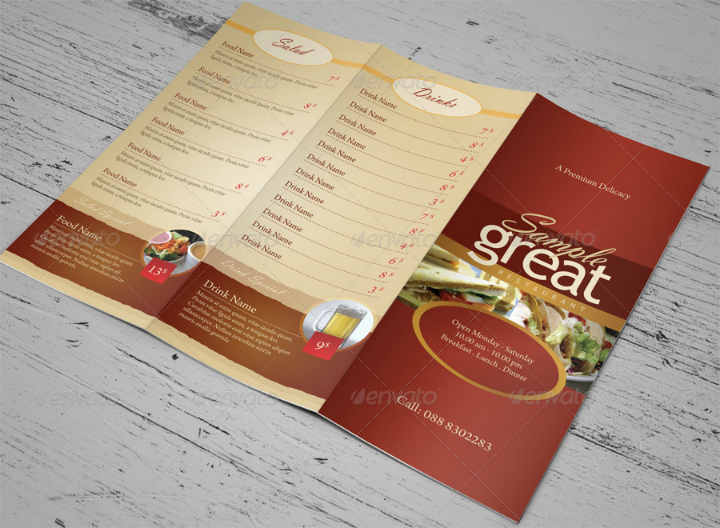 For those who want a formal takeaway menu design, the Diner Takeaway Menu Design template may be the one for you. 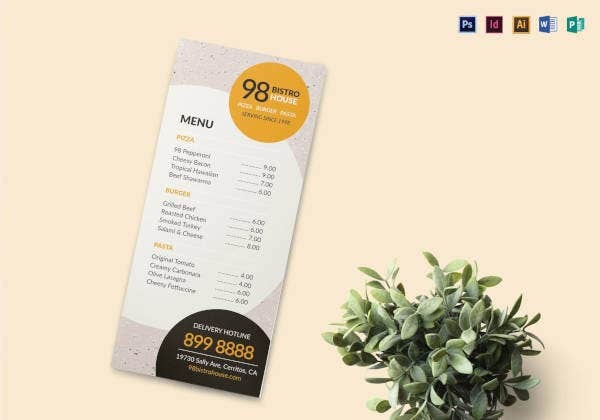 This menu design template features menu items in colored blocks while one picture of the main dish is highlighted on the menu card’s cover page in addition to the business logo design. As a customizable menu template, you may use a different color scheme for this menu template. Choose a color scheme that will best match your restaurant’s niche and image. 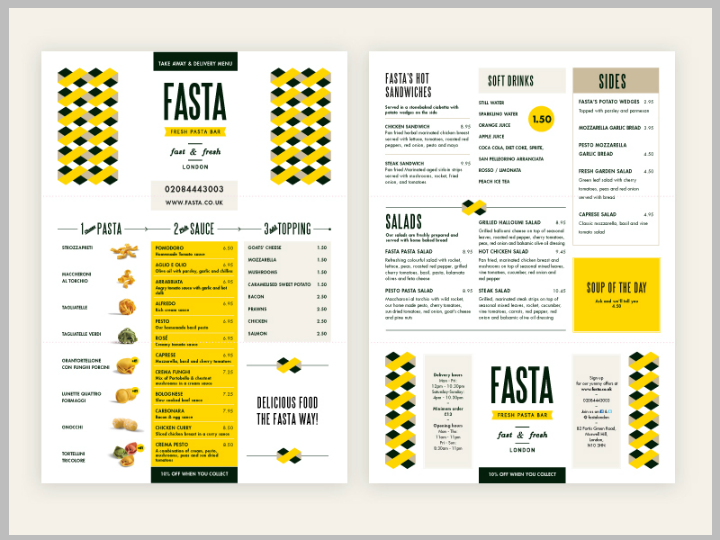 The Fast Food Simple Takeaway Menu Design template pictured above is an easy-to-edit menu design for fast food chains. Even small restaurants can use this type of menu template if they offer a limited number of dishes or meals as part of their takeaway service. To lure more customers into trying their food takeaway service, some dining places may add reminders, bonuses, and/or discounts to any takeaway order. 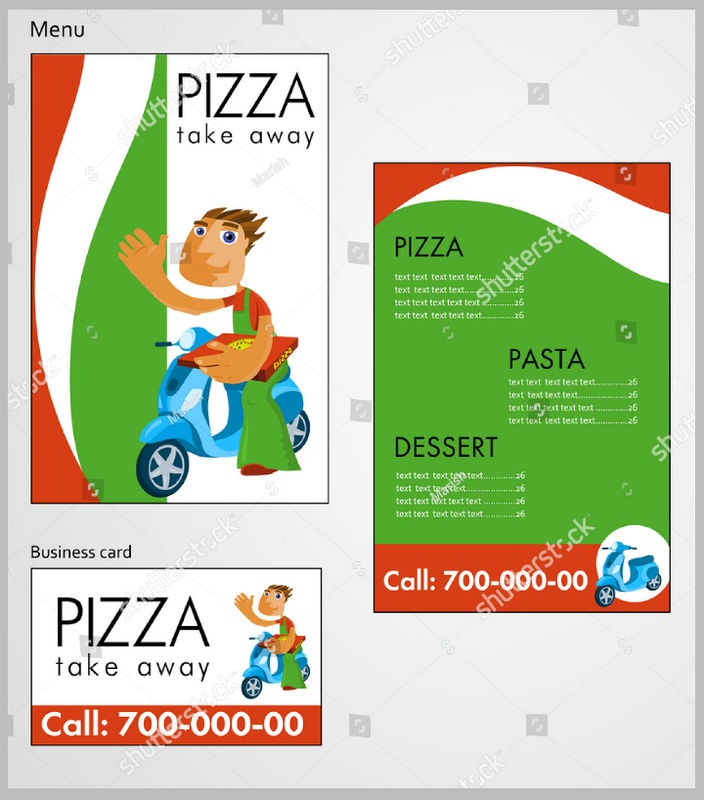 For instance, a pizza parlor may insert pizza flyers on their orders so that customers will be reminded of the takeaway menu options that the restaurant offers. 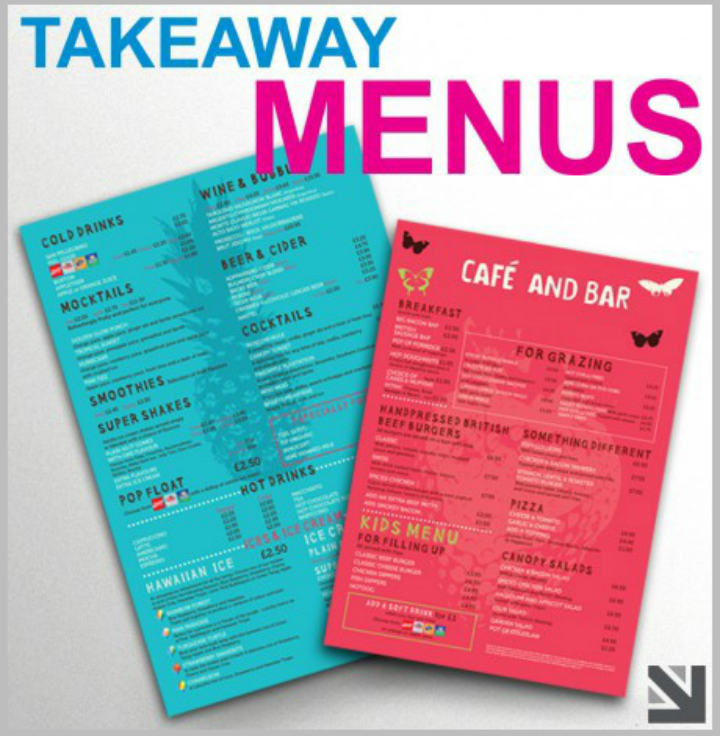 Takeaway menu designs are not limited to fast food chains and casual dining restaurants. It may also be used by places that cater to the fine dining crowd. If you are operating a fine dining restaurant, you may use the Minimalist Takeaway Menu Design as a base template for your own takeaway service. This menu design is not limited for use by formal restaurants. Any kind of dining establishment may utilize it as long as they want a clean and minimalist style on their menu cards. When recreating this menu design, it is important to use bold typefaces since they draw the menu reader’s eye well. Also, make sure to use geometric patterns at a minimum so that the entire menu card will not look too crowded. 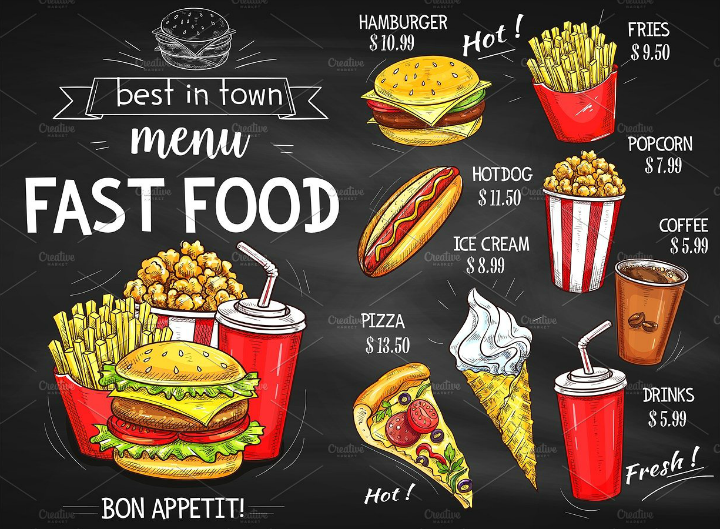 When choosing between different sample take out menu designs, you should always consider how the menu design will fit with the rest of your restaurant’s branded properties. For example, your takeaway menu should include the same business logo design, the same font style, and the same contact information. A good example of these principles applied in printable template form is displayed by the Pizza Takeaway Menu Design featured above. 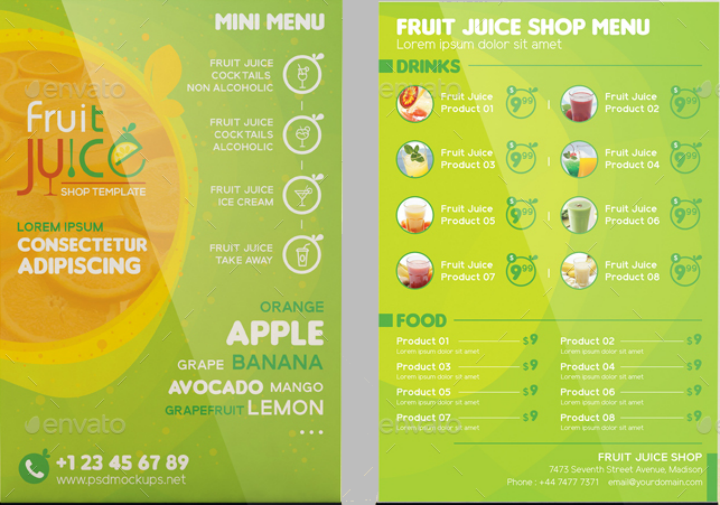 This menu design includes both a menu template and matching business card template. Tri-fold layouts like the Restaurant Tri-fold Takeout Menu Design work well if a restaurant has an extensive list of items that they want to include in their takeaway menu. This kind of menu template offers more space for listing menu items and food descriptions, as well as including photos of selected meals. Regular restaurants often follow this type of restaurant menu design template. This template is fully customizable so you can easily make changes to the background color, font styles, and image sizes on the template. 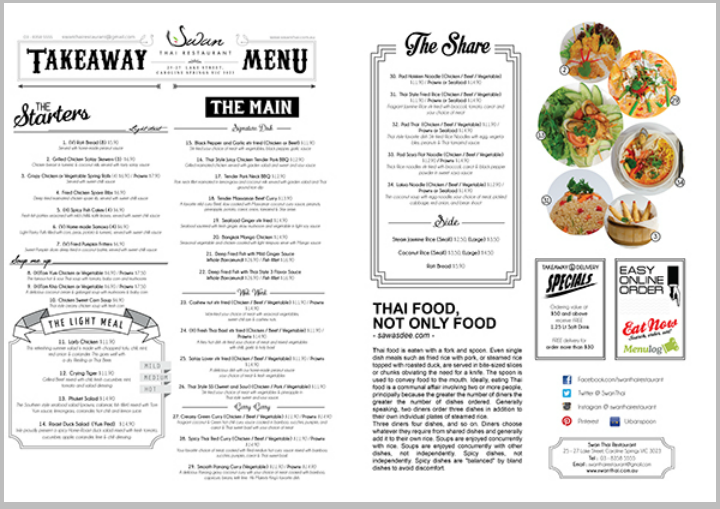 The Thai Restaurant Takeaway Menu Design template featured above follows a black-and-white print pattern. The only colored items are the images of different dishes that the restaurant sells. If you are looking for an affordable takeaway menu design, this menu template may best suit your needs. Printing black ink on white paper is more cost-effective in the long run especially if you are thinking of converting your takeaway menu into menu flyers. To attract more customers. Sometimes, customers will be in a hurry and cannot commit to a full sit-down meal inside a restaurant’s premises. A good way to still earn from these prospective customers is by giving them the freedom to enjoy their meals at home or on the go. By implementing a takeout service and using takeaway menus, your restaurant is able to cater to this portion of the dining public. Customers who like your restaurant’s food, pricing, and overall service will definitely appreciate this kind of service. To decrease restaurant traffic during peak hours. Perhaps your restaurant is already doing well as a business. However, some customers may be turned away or do not enter your store at all if they see that the place is packed and the ordering lines are long. To help remedy this, using takeaway menus will allow restaurants to serve more customers during these peak business hours. Customers who are in a hurry may go to a designated takeout counter while regular dining customers will be seated and served more efficiently. If, as a restaurateur, you encounter this problem, think about implementing this business strategy to boost sales. To simplify the ordering process. When people are in a hurry, they do not want to be overwhelmed by many choices or else they will only order things that they do not really need or want. By using separate takeaway menu card designs for your dining establishment, you give your customer an organized list of items that are available for takeout. This strategy also helps shorten the ordering process. To boost sales. As mentioned earlier, revamping your current restaurant menu template and then incorporating a separate takeout menu will allow you to cater to the needs of an underserved market. Sure, there is money to be made from customers who prefer to take sit-down meals at restaurants. But there is also additional revenue to be gained from those who do not prefer to dine at restaurants. Aside from fast food joints, not many other restaurants implement a full-scale takeout and delivery service. So if you implement this for your own dining establishment, you will be one of the go-to restaurants that offer takeaway food service. The Tri-fold Takeaway Menu Design pictured above exudes elegance due to its black background and gold text header font color. If you want your restaurant’s takeaway menu to reflect this same characteristic, then this may be the menu card design for you. 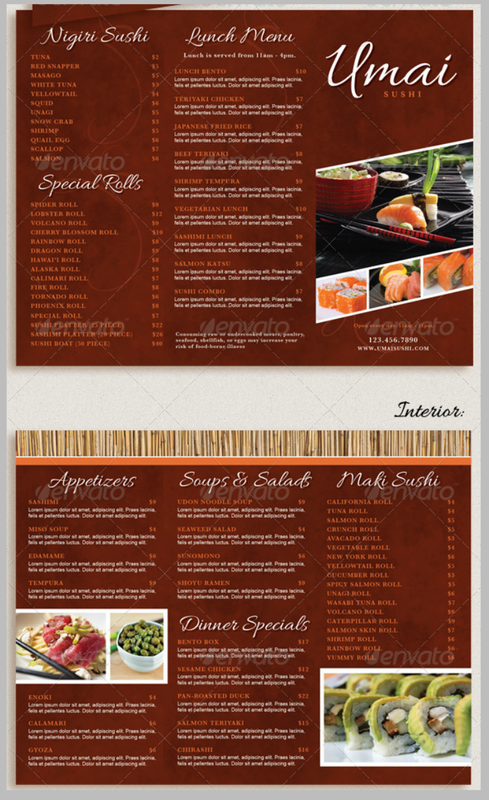 To recreate this menu card design, make sure to use a tri-fold brochure layout template. You may use Adobe InDesign to make other layout changes that will match the text and image elements in your menu card.